I went back to basics this year for my birdaversary. Back to Stub Stewart State Park where it all began three years ago when I was first inspired inspired by the curiosity and wonder of birds. 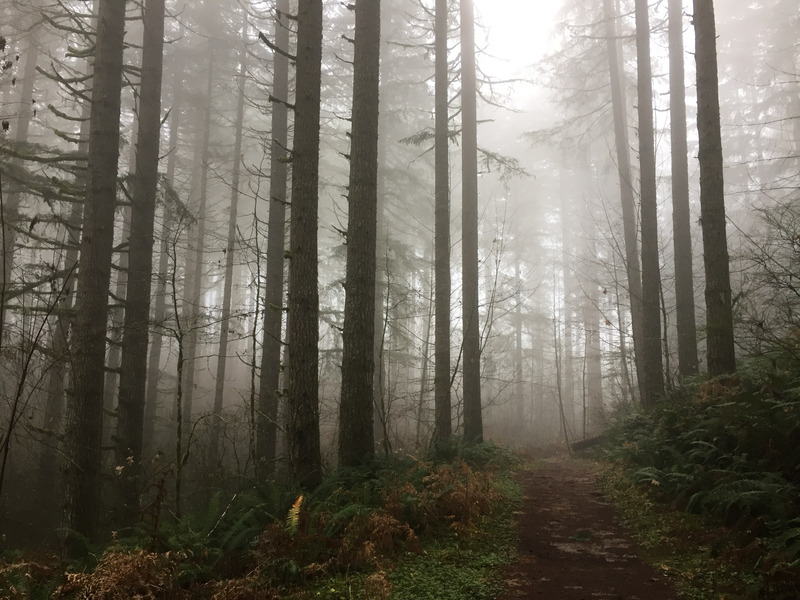 It was rainier and foggier this time, but that didn’t stop me from enjoying this classic Pacific Northwest forest. Knowing what I know now, this park in winter is not exactly a birding hotspot. At least to find a lot of species, but don’t tell that to my former self. 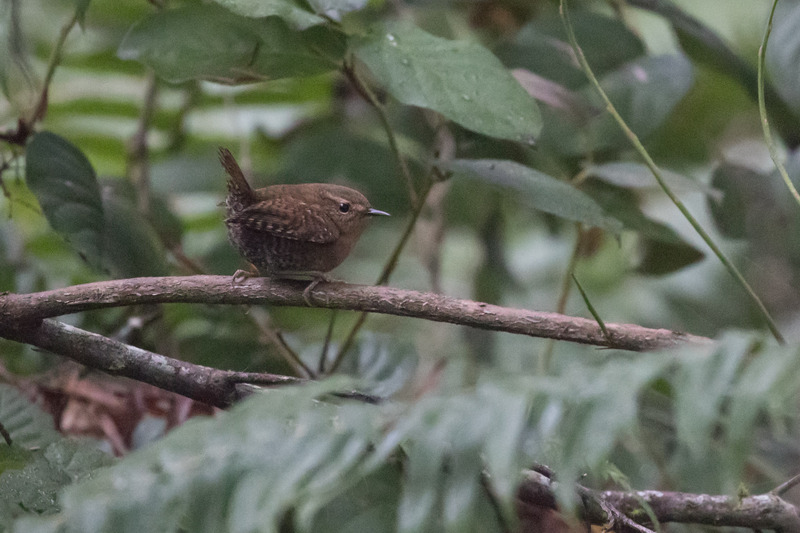 It’s the type of place where you can walk for miles and see nothing, or you might bump into a Northern Pygmy Owl like I did on day one. 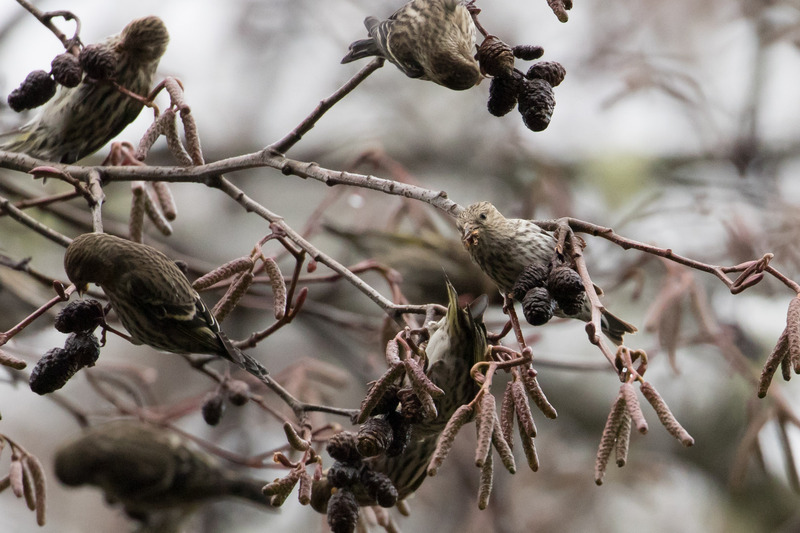 No owls this time, but I did find a flock of 90+ Pine Siskins. I wouldn’t have known what to do with these back then, but this time I knew to scan for Common Redpolls. Nope, not that lucky. 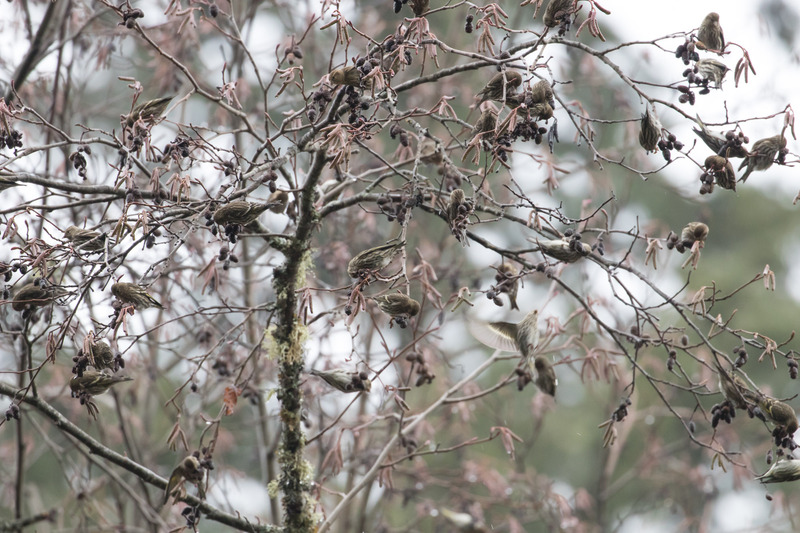 Nobody here but us siskins. 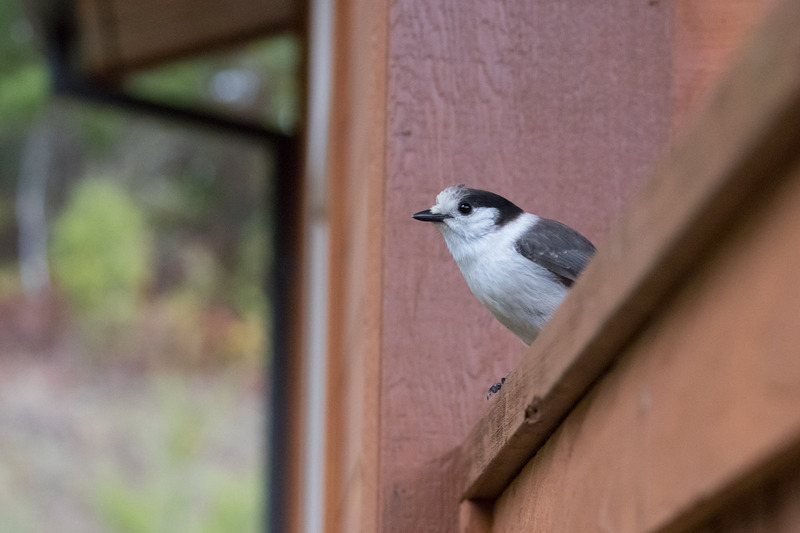 I hung out with my corvid pals, Steller’s Jay and Gray Jays that hopped around the cabin deck looking for a lost crumb. 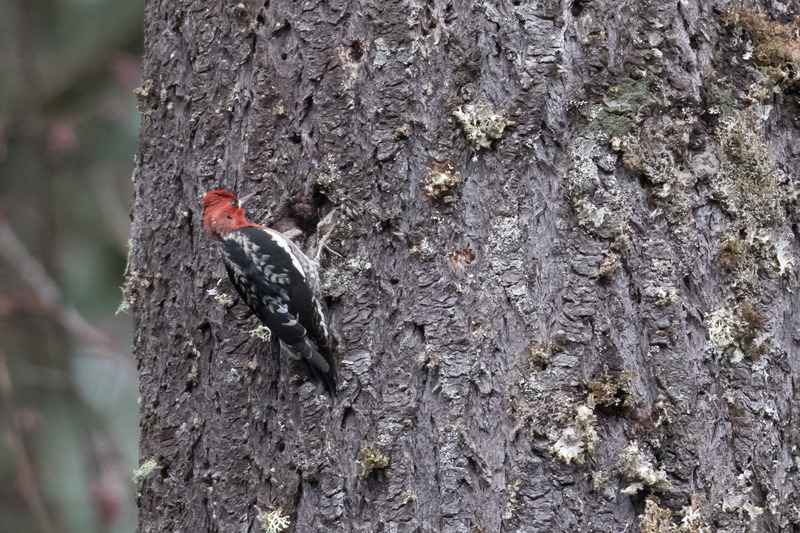 I reconnected with the Red-breasted Sapsucker which was my second-place winner for spark bird (after the Pygmy Owl). 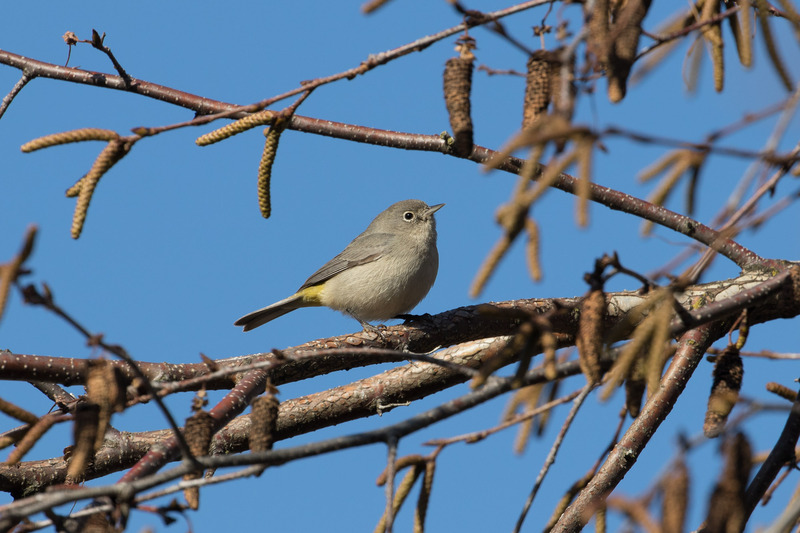 I saw at least a half dozen Brown Creepers, Golden-crowned Kinglets, and perky Pacific Wrens. 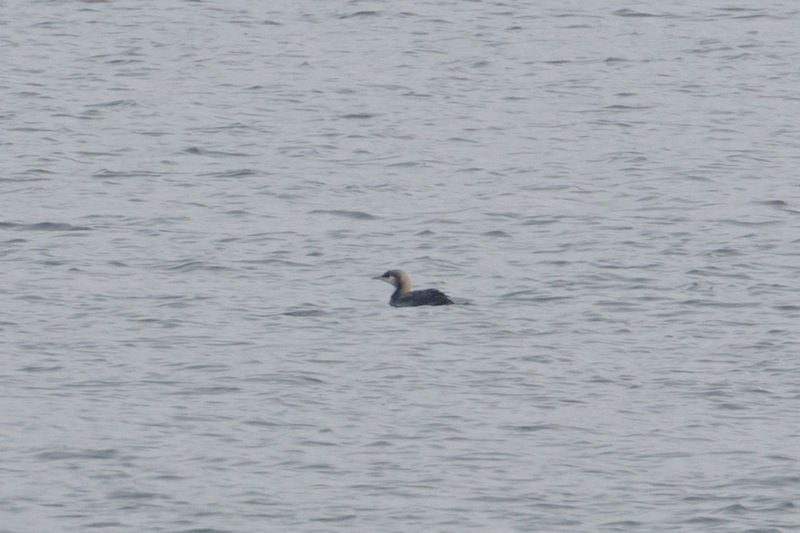 Which I’m now confident is the mystery bird I saw on day one. Three years later, mystery solved! 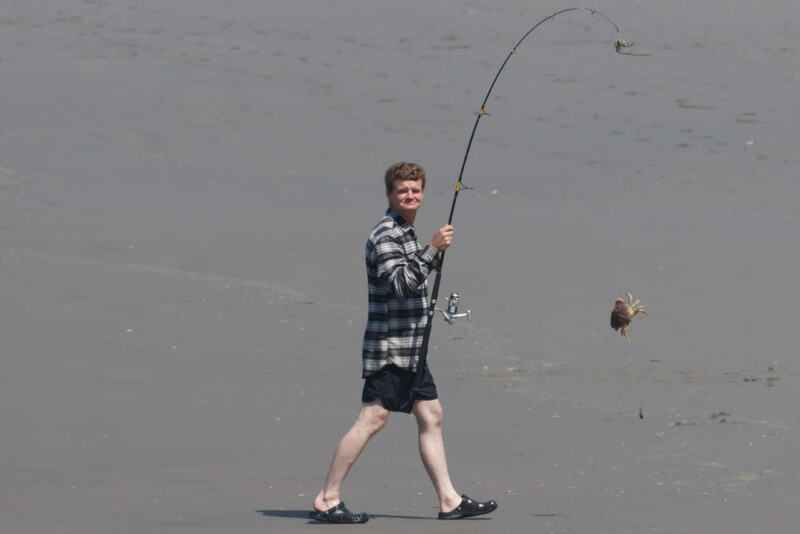 I saw only 12 species this time compared to 14 then, but it was still fun remembering that amazing day. 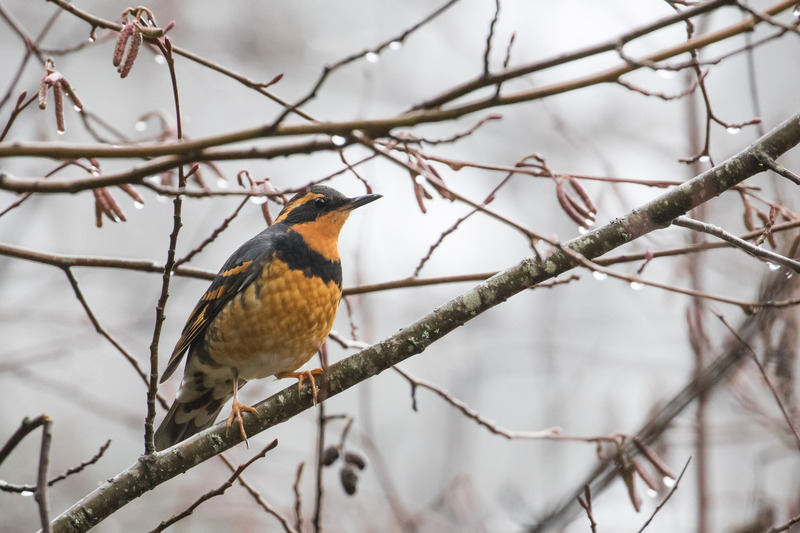 Much thanks to forest birds like this Varied Thrush. It’s been an awesome year! Not a Big Year, but an awesome one. Between Texas, Florida, and the Pacific Northwest I’ve seen 412 species bringing my life list to 469. It’s hard to believe I’ve seen so much in such a short time period. It goes by so quickly sometimes I don’t get the chance to write about everything. But I feel some things deserve mentioning. 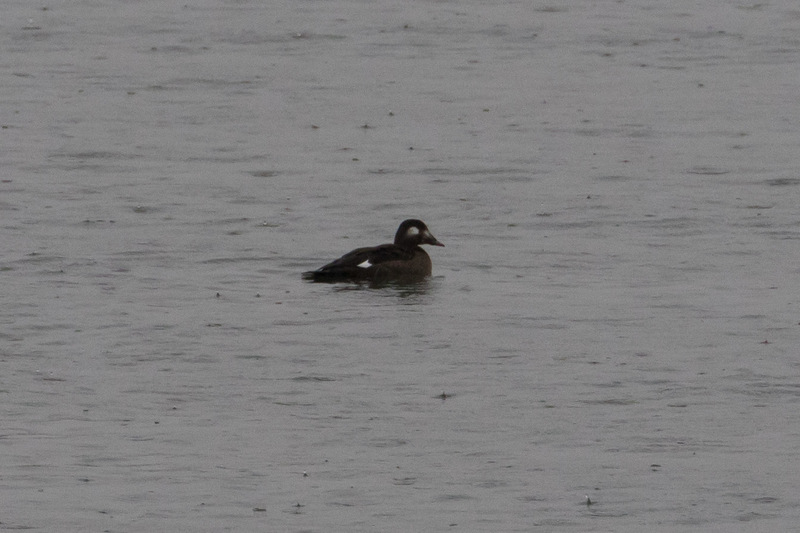 Like my 200th Multnomah County bird, the White-winged Scoter that I saw in the pouring rain the day before I left for Florida. 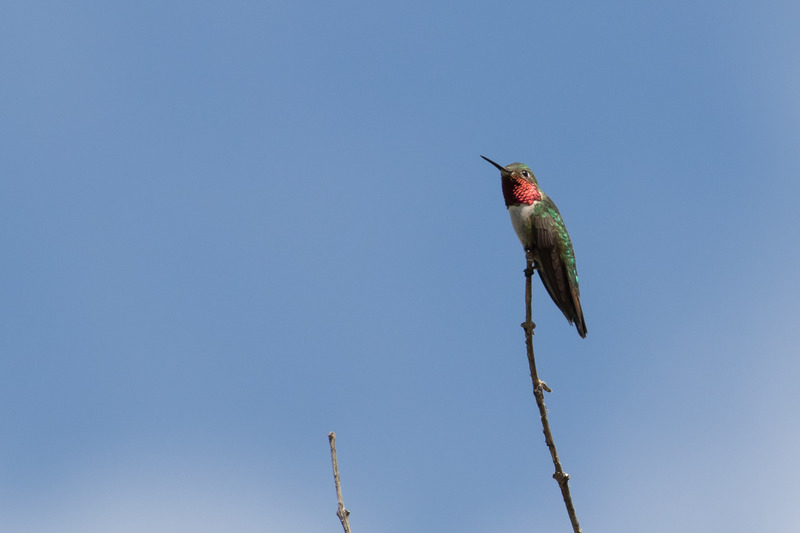 The Broad-tailed Hummingbird I met this summer in Colorado while visiting a friend. 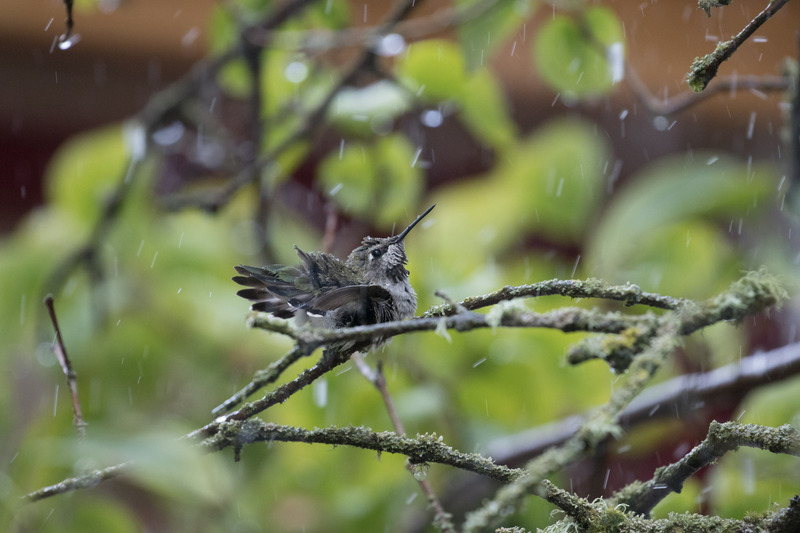 And who could forget the happy hummers in the yard when I turned on the sprinkler during the 100+ degree summer days? 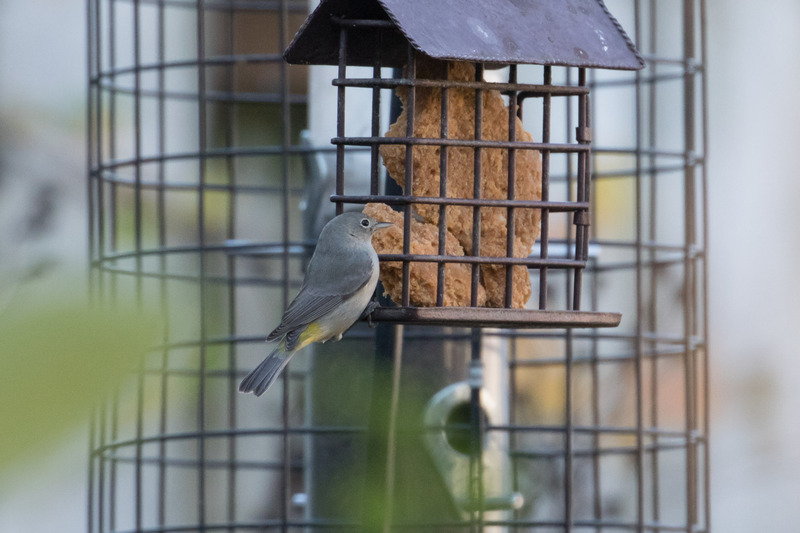 Yard-birds bring me great joy. 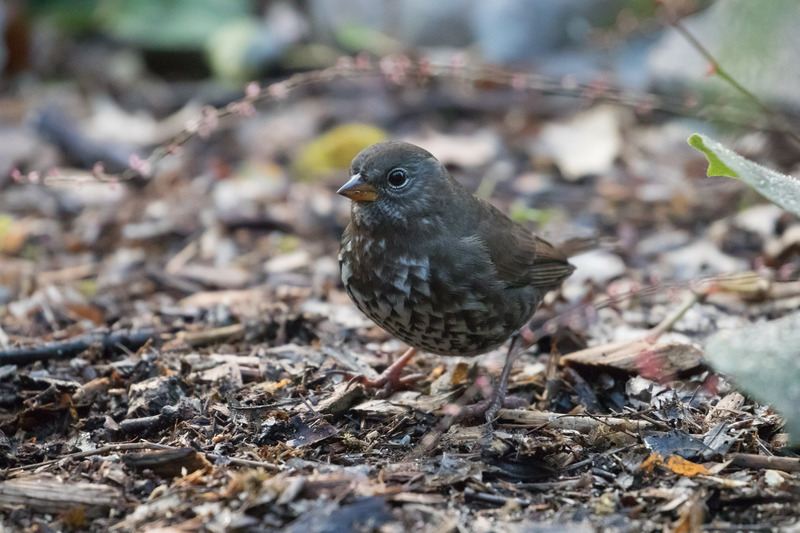 While I haven’t yet seen a returning Townsend’s Warbler yet, we’ve had new sparrows this year, the Fox Sparrow who likes scratching in the leaves. 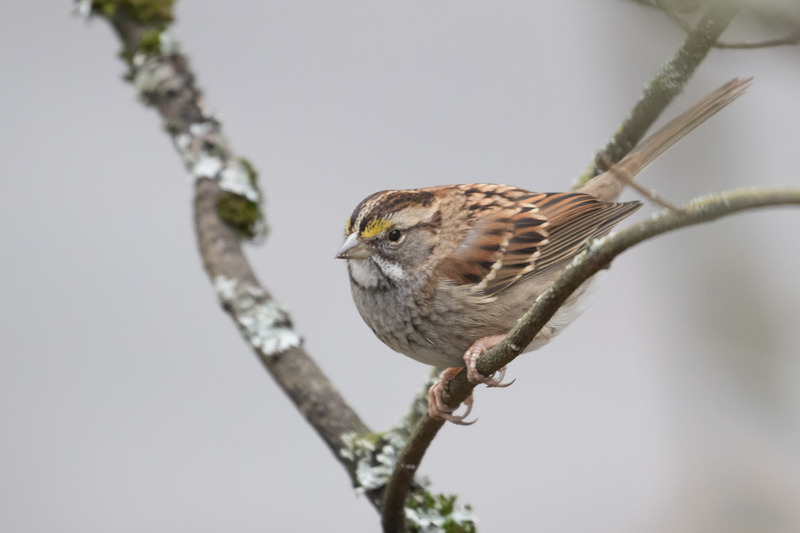 And my new favorite, White-throated Sparrow. Appropriately at the Birds and Beers white elephant gift exchange I won an awesome White-throated Sparrow painting by my friend Max! It’s bright and cheery and I love it. This wouldn’t be an update post without mention of my 5 mi-radius. 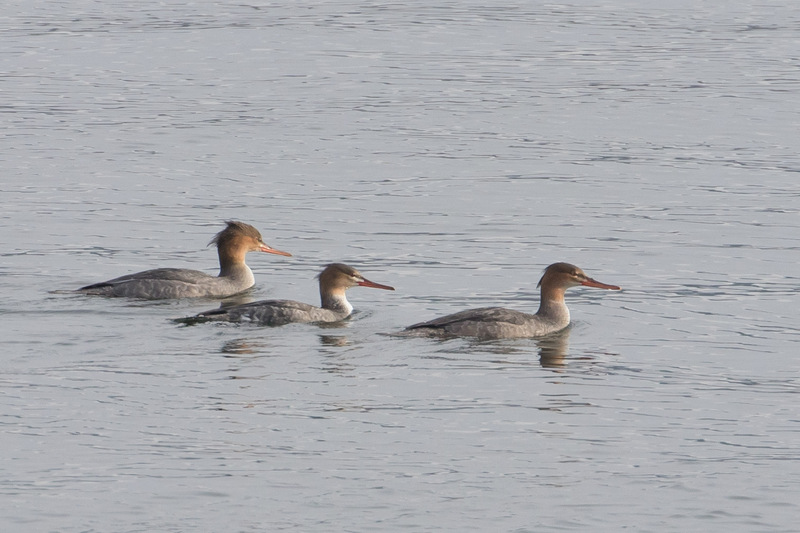 On the way home from the coast last weekend I picked up a few more, Red-necked Grebe, Black Phoebe, and a Spotted Sandpiper that’s roughly the size of a goose head. 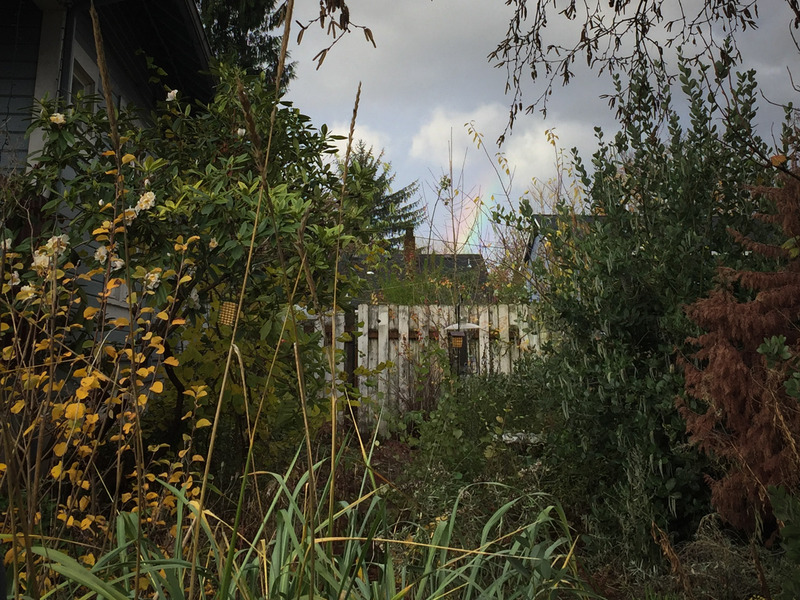 One of the best things I’ve done this year was volunteer at the Portland Audubon Wildlife Care Center. No photos due to patient sensitivity, but I can talk about how rewarding it was to give back. 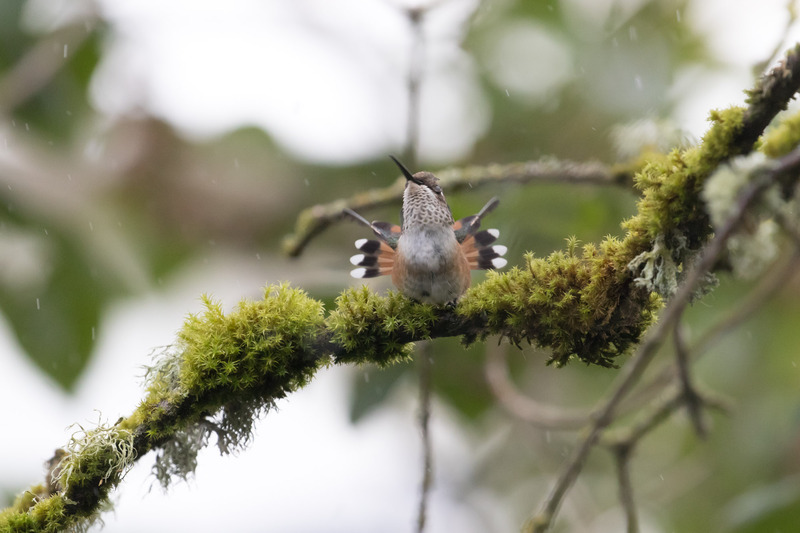 Some of my favorite moments were feeding young crows that gobble down food with a “ang-ang-ang,” seeing adorable little hummingbirds, and hearing the mysterious calls from baby Black-headed Grosbeaks. The best of times! Coming up I have much to look forward to and am thinking of goals for next year. I’d like to beef up the yard bird list, but that requires me to be at home more. Currently, we’re at 51 species, the most recent addition being a Barred Owl calling outside the window at 4:30am (Who cooks for you-all!). I still haven’t found a Western Screech Owl on Mt Tabor. Maybe I’ll get to the bow of a boat next year. Do White-tailed Ptarmigan exist? And there are six counties in Oregon where I haven’t seen a single bird, (Yamhill, Marion, Wallowa, Curry, Jackson, and Malheur county), so that is a good excuse to do some road trippin. That is genuine enthusiasm. Not excited? 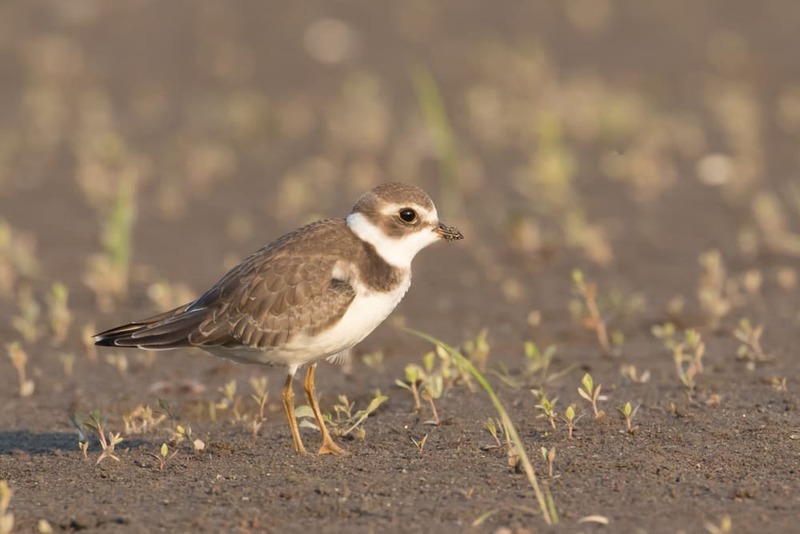 Here’s an adorable Semipalmated Plover to ease some of the discomfort. 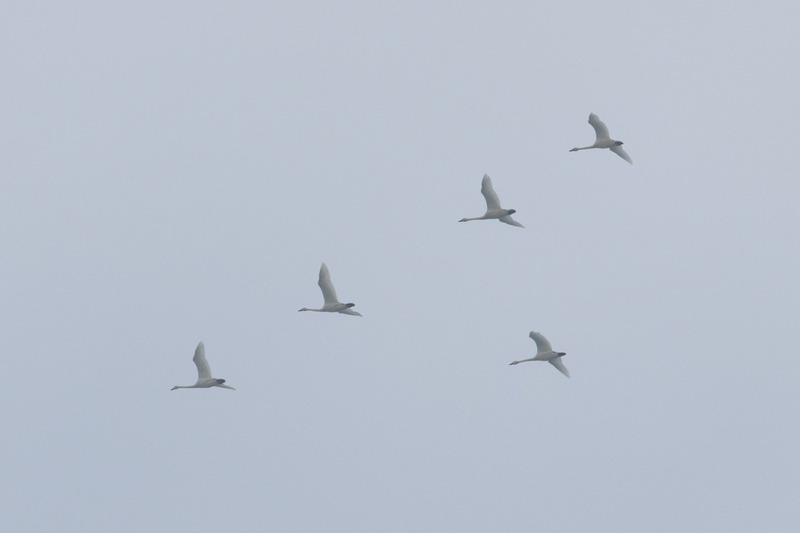 Fall migration is happening and I am facing it head on. 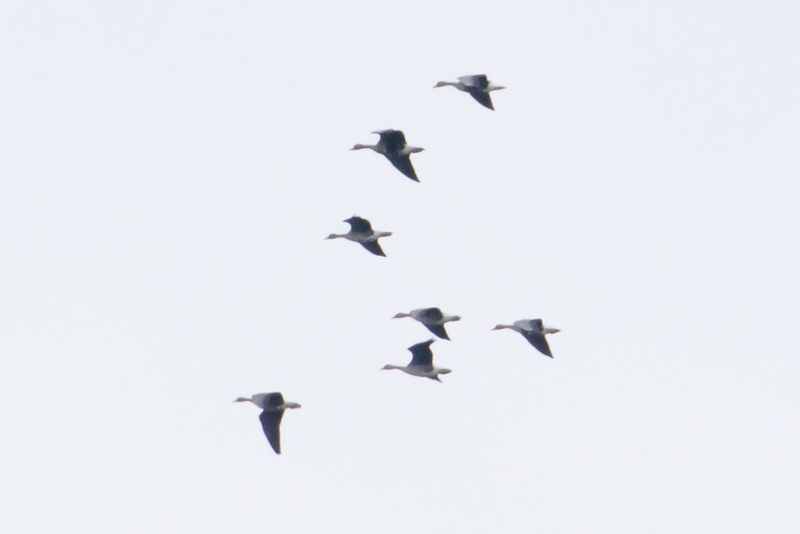 Because I went to Smith and Bybee Lakes and totally failed at identifying birds. I forgot how hard it is. 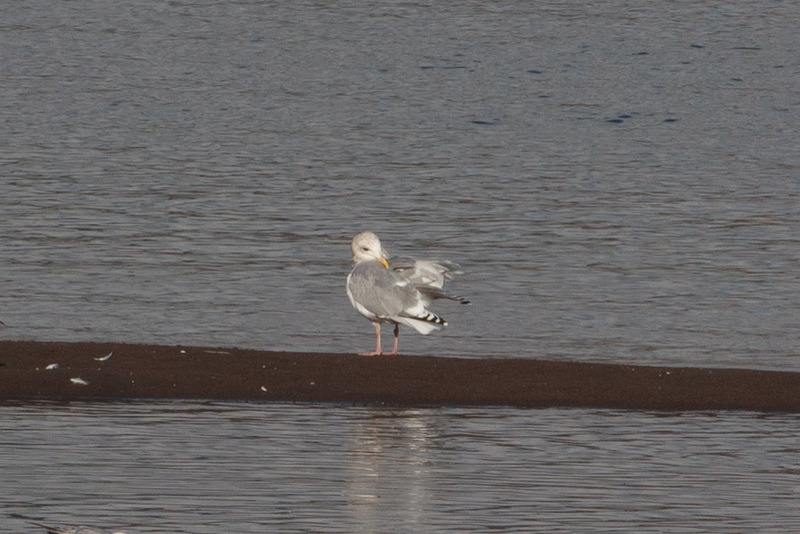 There’s hundreds of shorebirds there, and I had trouble identifying one of them. So I do that thing that I do when I can’t figure something out on my own. I seek out help. 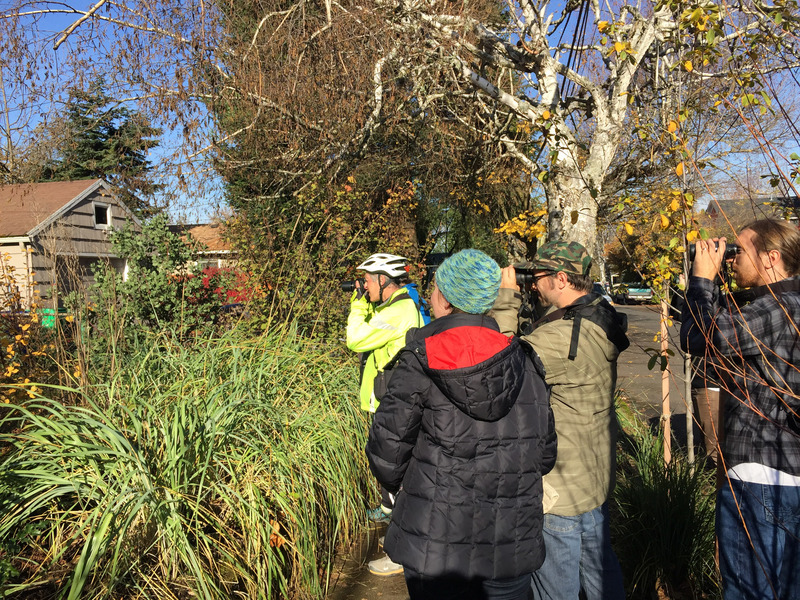 That same week I logged on to Portland Audubon’s classes, and to my luck I saw “Learn to Identify Fall Shorebirds” with John Rakestraw. And it wasn’t full. 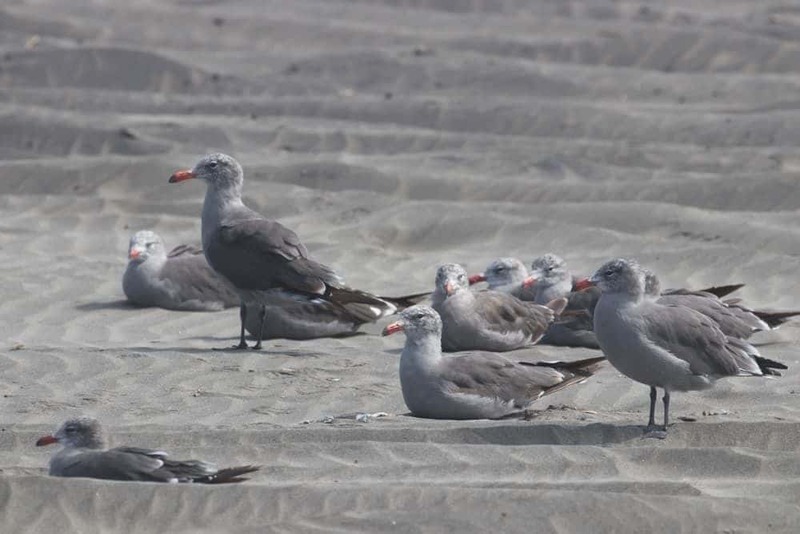 John is the same instructor who teaches the Gull ID class and Warblers and Flycatchers, as well as many others. He even wrote a book, Birding Oregon. I was in good hands. 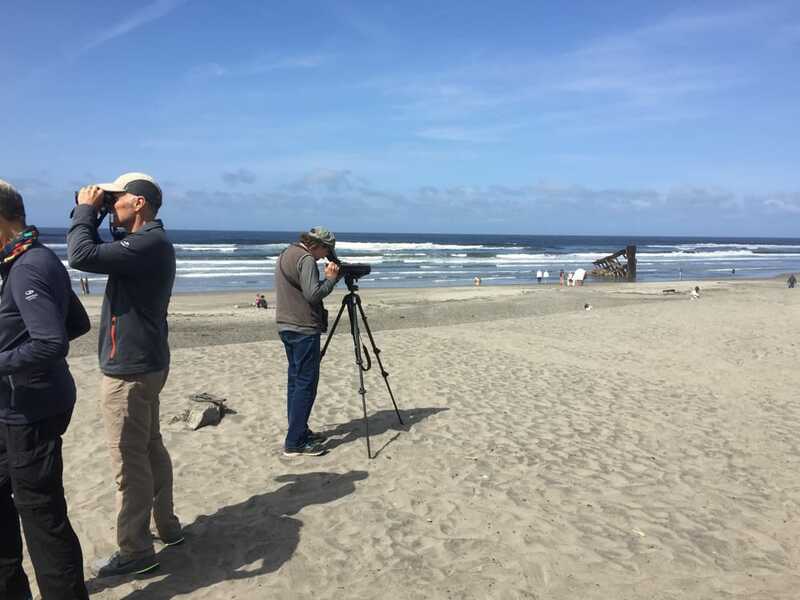 In the classroom we learned of the 20 or so shorebirds that visit the Oregon coast and Willamette Valley. We looked at large slides of birds and called out the field marks. It’s all about the field marks; the shape of the bird, size of the head vs. the bill, the color of the legs, and the bird’s behavior. 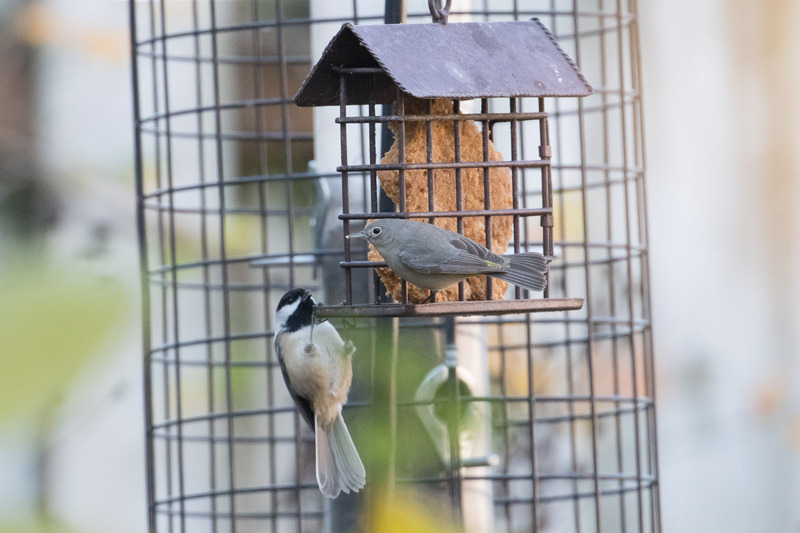 It’s knowing what to look at for each bird. This is the key. 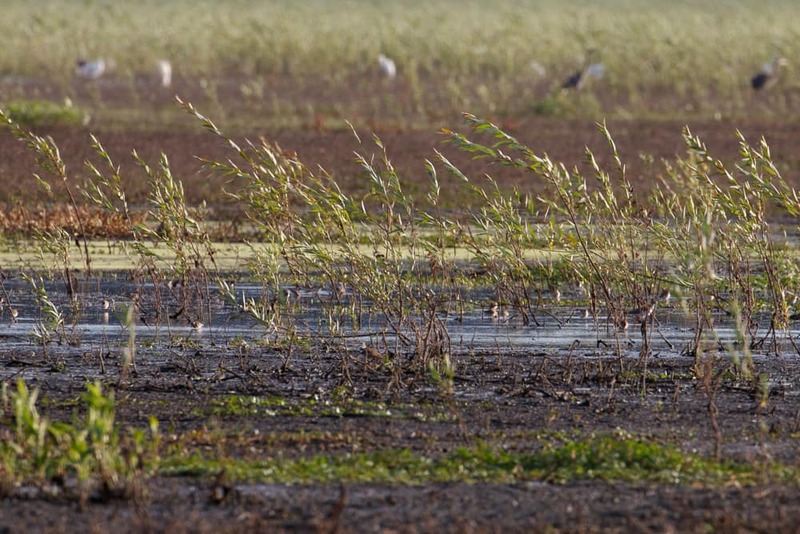 Long-billed Dowitchers prefer freshwater ponds, whereas Short-billed Dowitchers like tidal marshes and estuaries, so location and habitat can also provide clues. It’s all part of a puzzle and that’s what makes it fun. Our field trip fun started one foggy morning at Seaside looking at birds on the rocks. Or really birds that look like rocks. 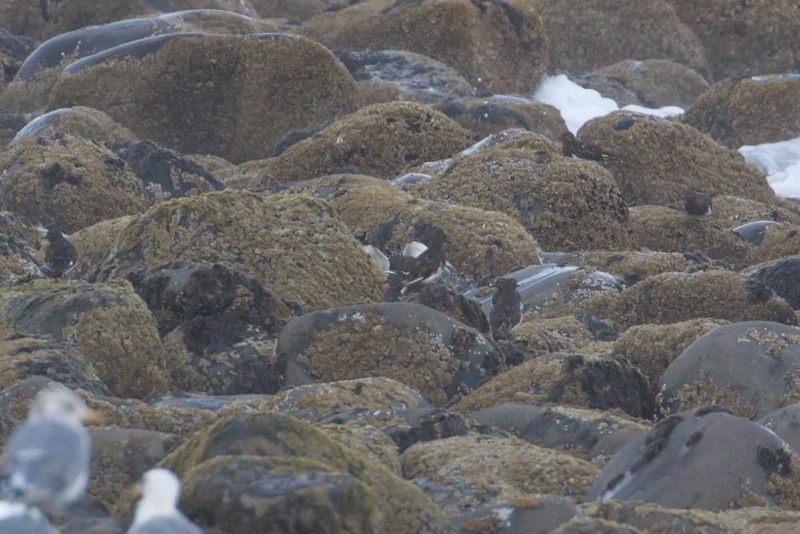 We found a pile of Black Turnstones. We hoped to pick out a Ruddy Turnstone, but none showed up this time. We dipped out on shorebirds at a couple more spots until we lucked out on some birds that look like mud. 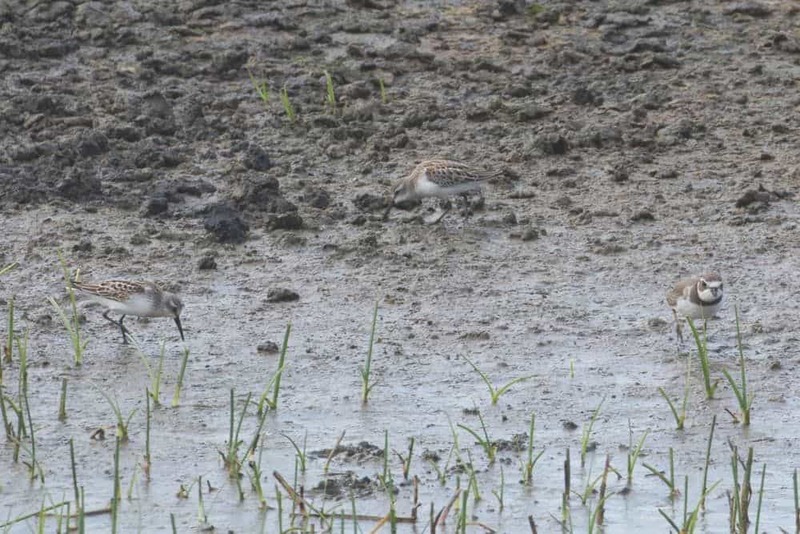 That’s two Western Sandpipers on the left and one Semipalmated Plover on the right. Westerns have black legs and long droopy bills. Semi Plovers have one breast band. 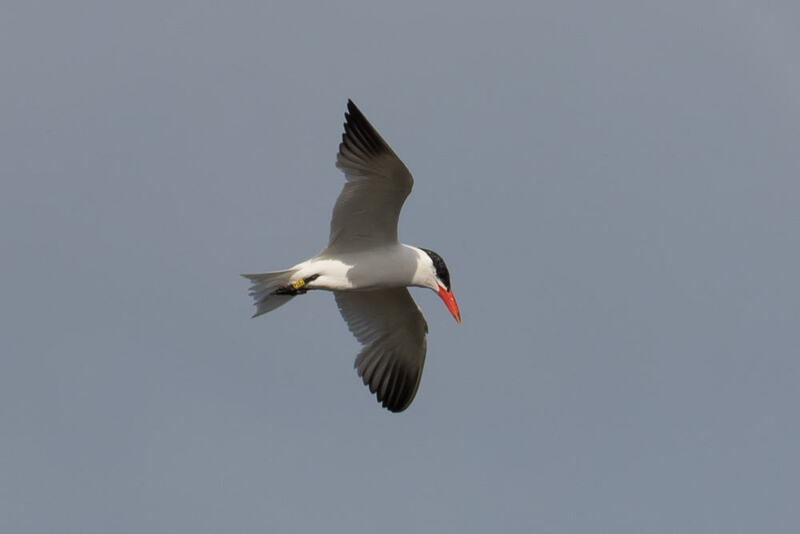 We also saw Caspian Terns soaring above the water, and I didn’t notice until looking at photos later, this one has a yellow leg band. We made it to Fort Stevens State Park but there was still low shorebird activity. Until we looked in the distance. We walked farther down the beach to get a closer look. 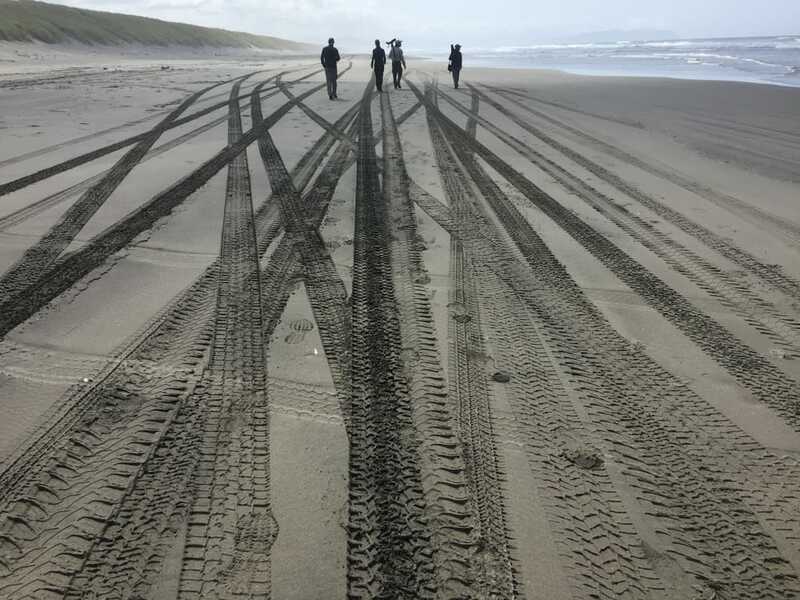 But trucks are allowed to drive on the shore here and they’d scattered the flock. 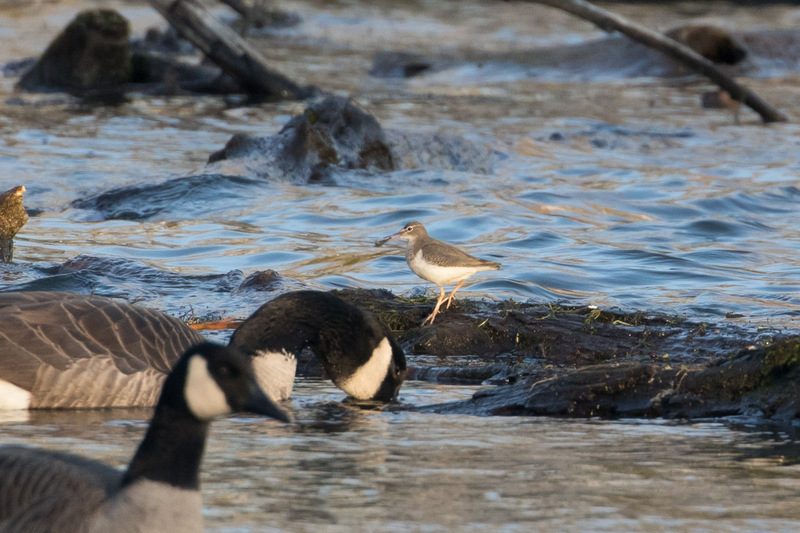 Eventually we got looks at more Western Sandpipers, and even had a Semipalmated Sandpiper in the mix for comparison. 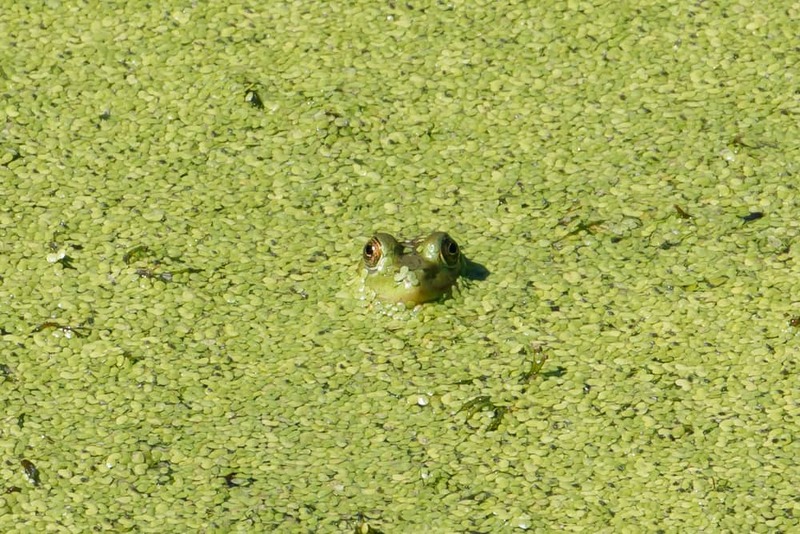 All Westerns – long, droopy bill, black legs. 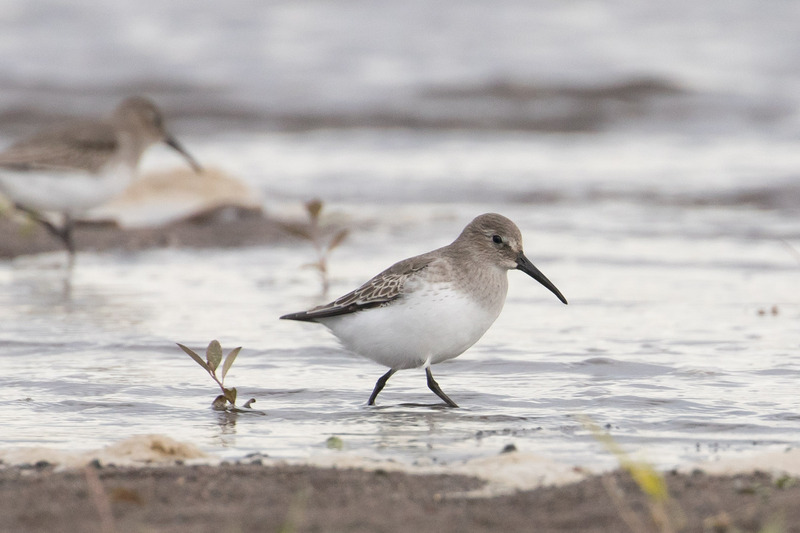 Westerns and Semipalmated look almost identical except Semipalmated Sandpipers have a short blunt bill. It was tough to get good looks before the flocks moved along. 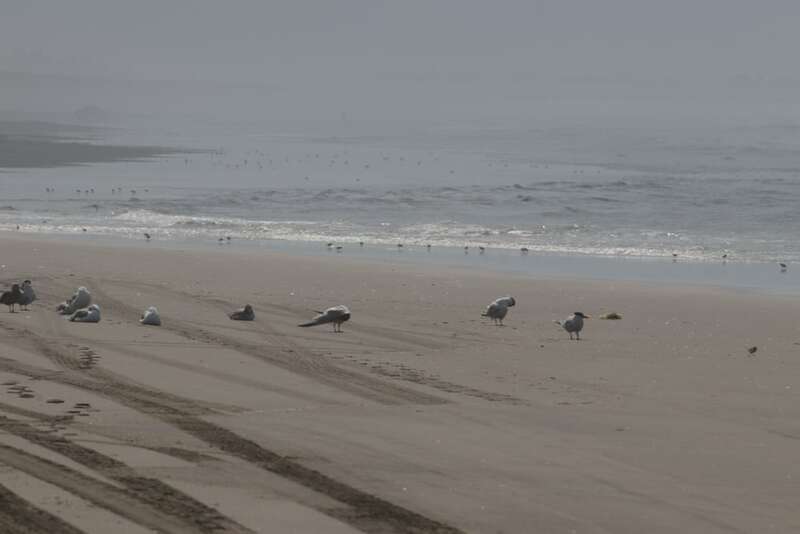 Shorebirds not cooperating? 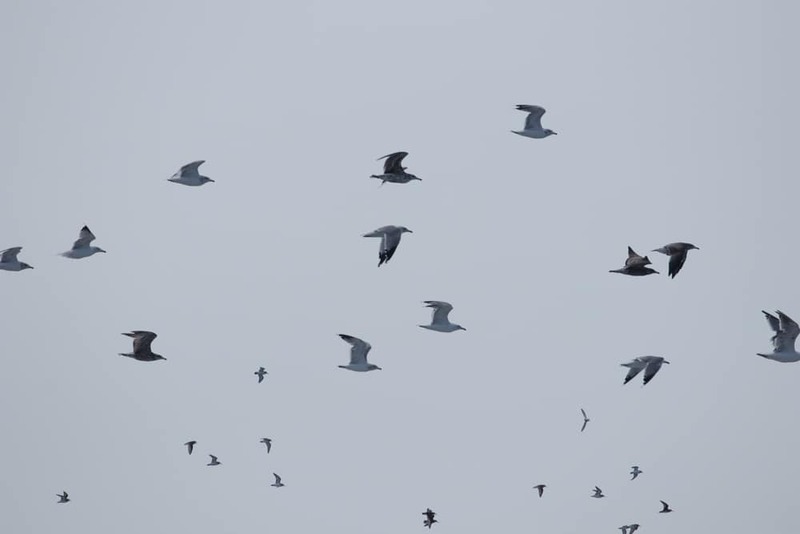 Let’s look at gulls! 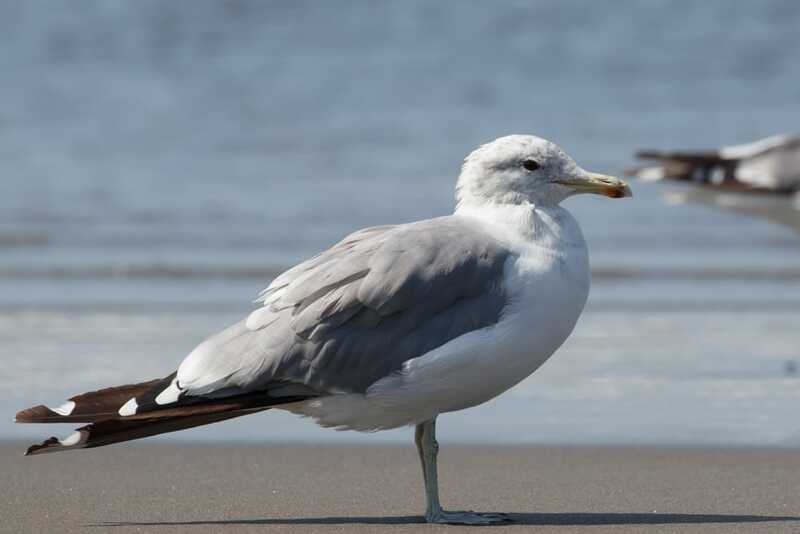 And some of my favorite gulls were visiting, Heermann’s Gulls. Two E’s two N’s, orange bills, unmistakable. 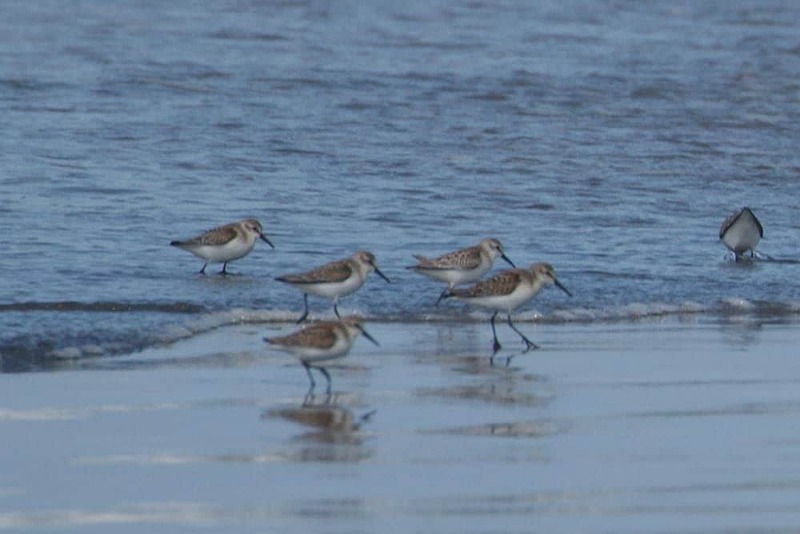 John admitted shorebird numbers seemed unusually low. 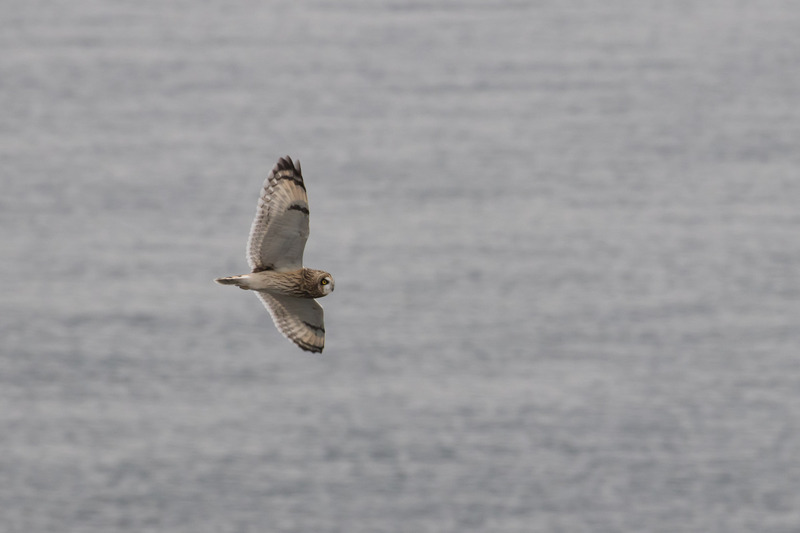 We missed out on Sanderlings, Black-bellied Plovers, and a few others. We checked back at Seaside, but found nothing new. Except jousting crabs. The one above lived to tell the tale but I can’t say the same for this one. 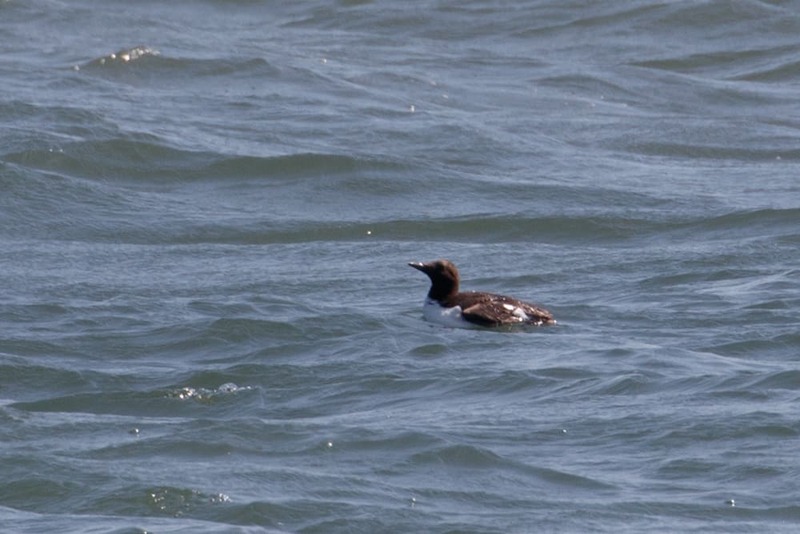 We made another stop at Seafarer’s Park near the Hammond’s Marina where we found a Common Murre swimming out of place this far up the river. The best action of the day came next. 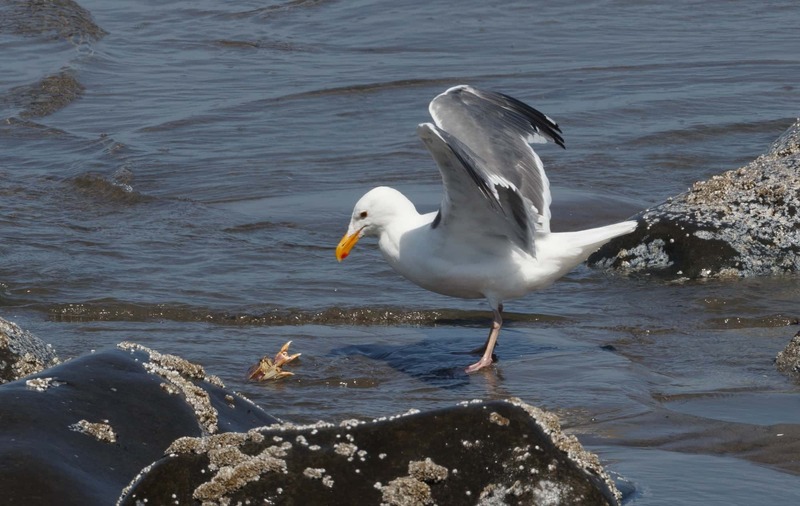 Apparently Heermann’s Gulls are pirates! 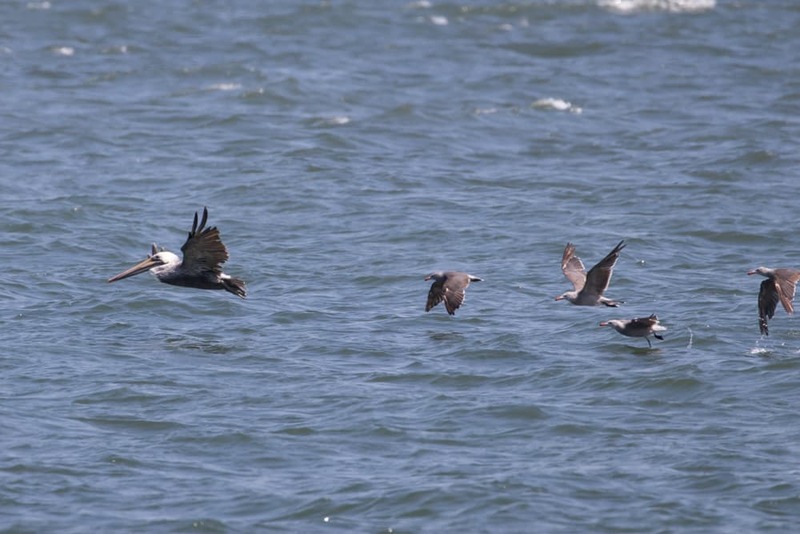 They wait for a Brown Pelican to dive, before pouncing and trying to pry the meal out of the pelican’s gullet. Neat stuff. 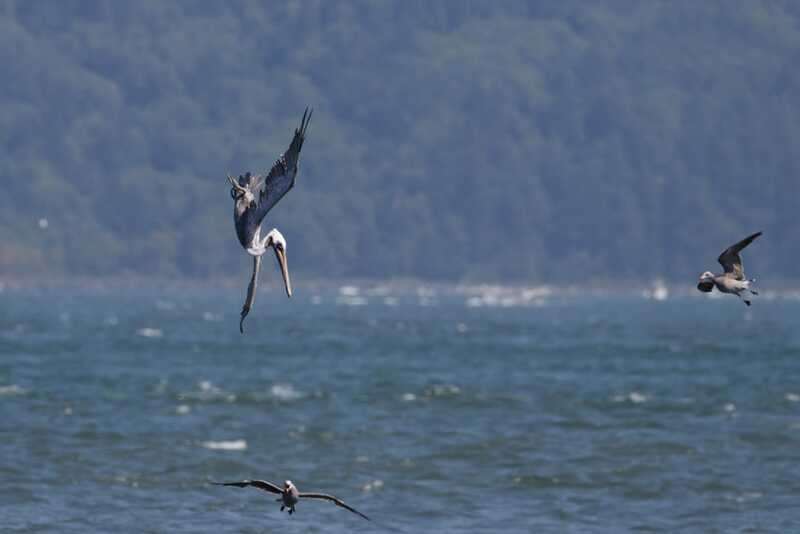 I felt bad for the pelican, but they’re not exactly known as saints either. 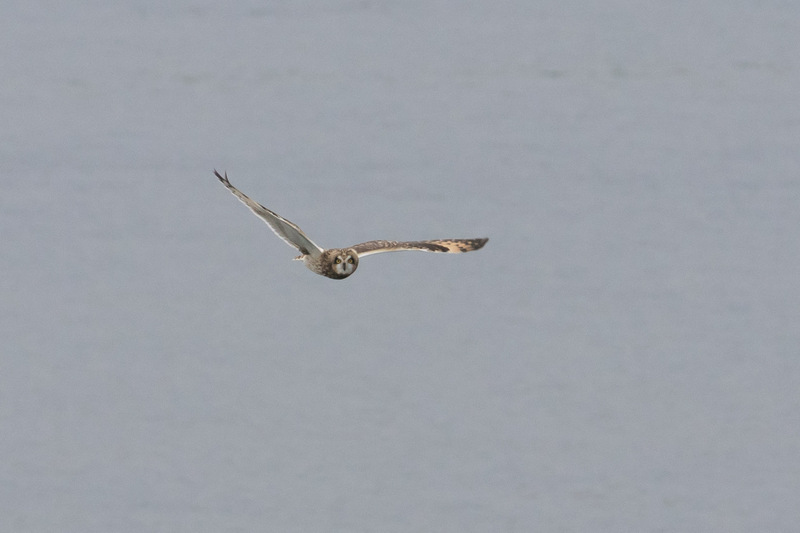 The shorebirds were so few at the coast we made an extra stop at Fernhill Wetlands on the way back. But the day was hot and the heat waves made it difficult to see the birds in the distance. 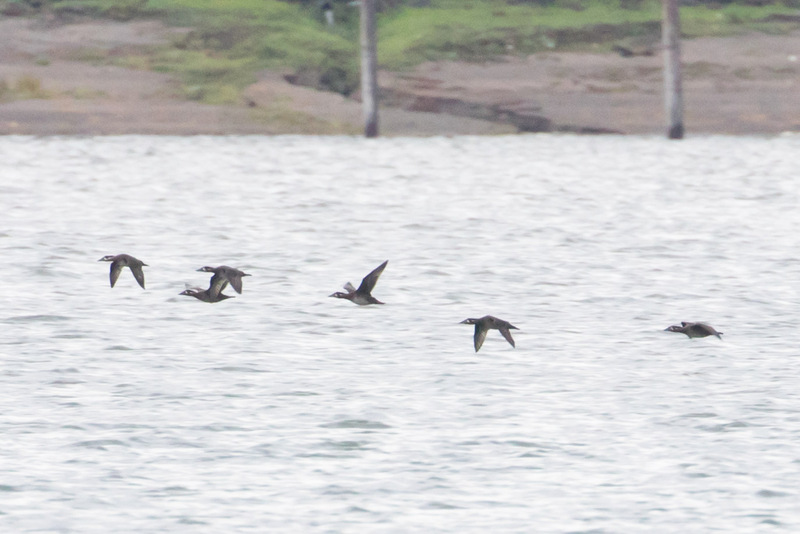 I’ll spare you the blurry photos of the Spotted Sandpiper, Long-billed Dowitcher, and Least Sandpipers. 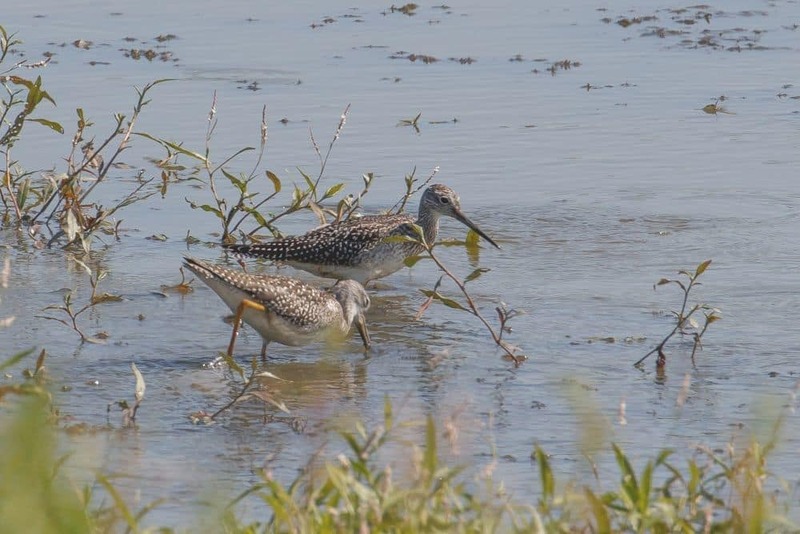 Here’s a pair of Greater Yellowlegs instead. 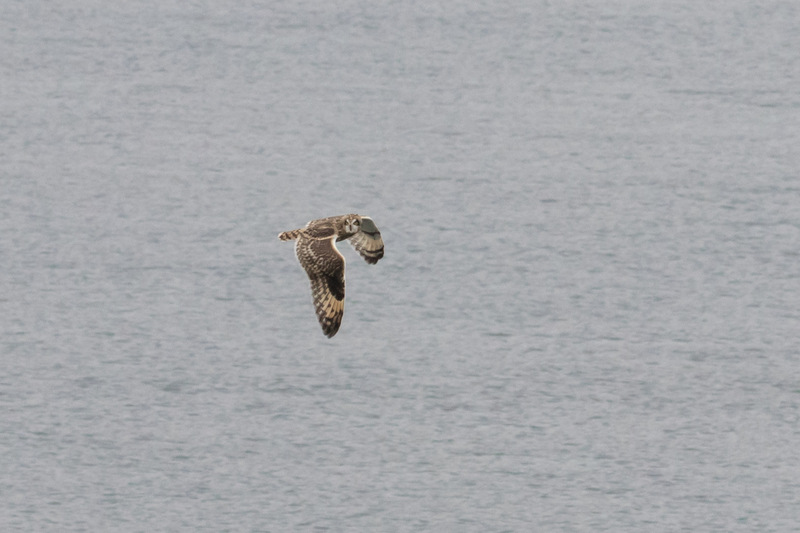 That bill looks like it’s twice the length of the head and those are some nice yellow legs. Bird identified. It might seem obvious, but if there’s one take-home message of the day it’s that there are limitations. Sometimes the birds are too far, or they move too quickly; distance, weather, terrain, trucks, there’s so many obstacles, but it’s important to focus on what can be seen and not get discouraged. And when that doesn’t work, stay at home and make flash cards! 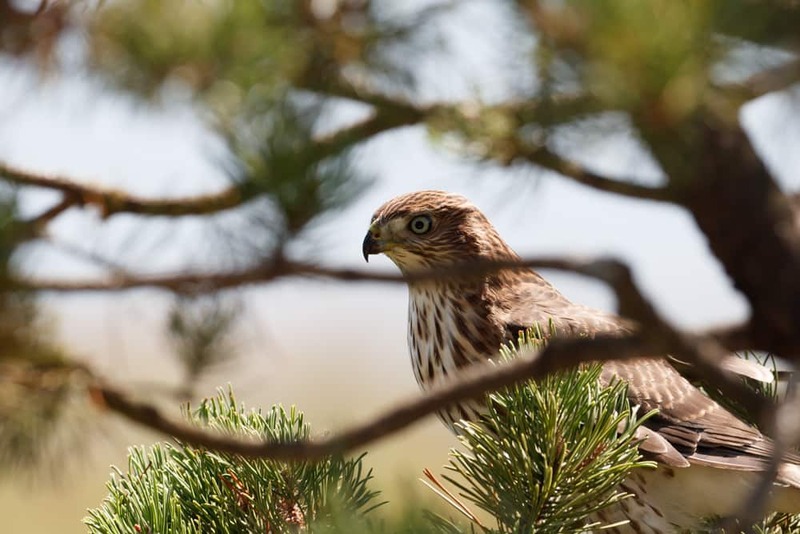 Moving along, we got good looks of a juvenile Cooper’s Hawk. 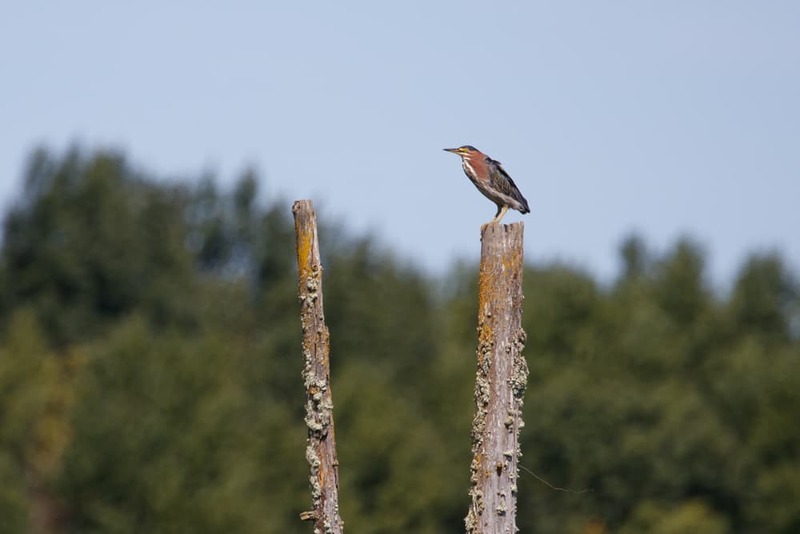 And a Green Heron oddly perched out in the open. 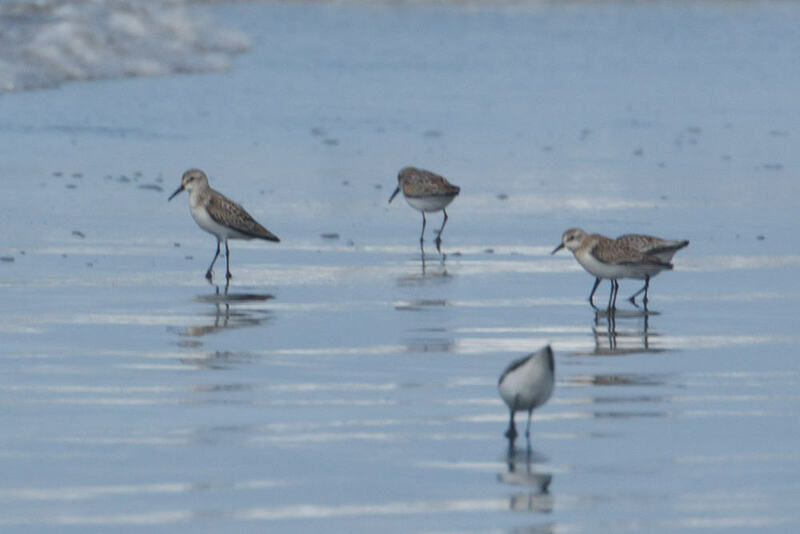 Not enough shorebirds in my shorebirds post? How about brown ducks instead. Just kidding. 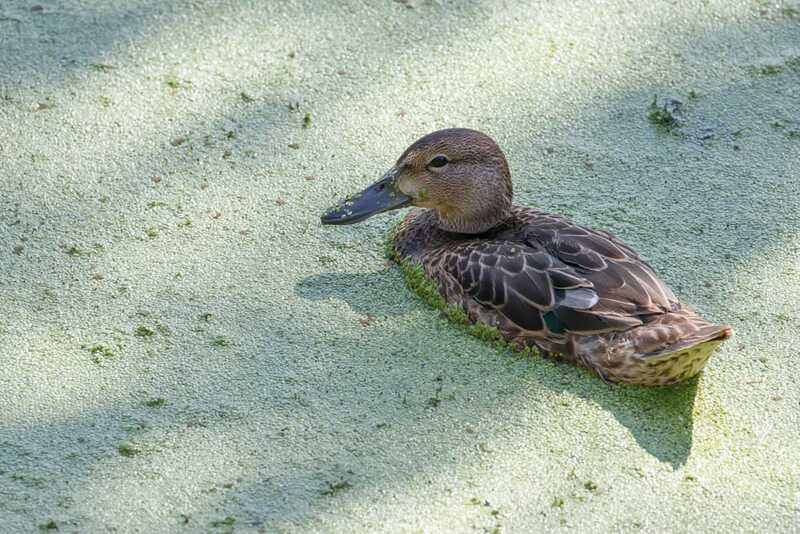 I’ll save the Cinnamon Teal for later and keep my eyes peeled for more peeps to identify in the mean time.